Julia Louisa Hardy Lovejoy and her husband, Charles Lovejoy, came to the Kansas Territory in March, 1855. 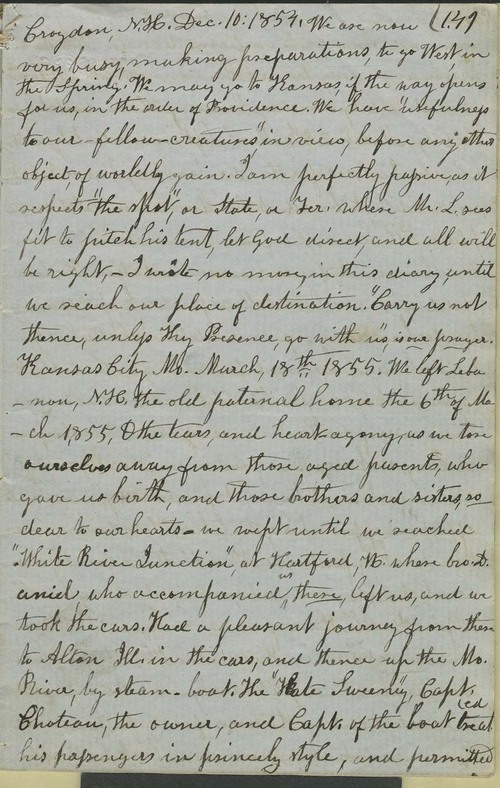 Lovejoy described the trip and their first months in Kansas Territory in her diary. The diary entries were fairly sporadic, however, so there were significant gaps in her account of life in the Kansas Territory. Lovejoy's writing was very emotional when describing the illness and death of their daughter Edith, when referring to the conflict in the territory, and when writing about her religious beliefs. The diary also contained some descriptions of Lovejoy's daily life. The Lovejoys had two older children (Charles J. and Juliette) and a five year old daughter, Edith, when they came to Kansas Territory. Their son Charles may have come to Kansas before the rest of the family. Edith died in Lawrence, Kansas Territory, on May 3, 1855. Julia was pregnant at the time and a son Irving was born September 17, 1855. Juliette married Dr. Samuel Whitehorn from Hudson, Michigan, on March 9, 1856, in Manhattan, Kansas Territory. Juliette died November 20, 1860, at Manhattan, Kansas, at the age of 21. See the biographical sketch in the "Personalities" section for more information about the Lovejoys.